I love wearing makeup. Sparkly eye shadow and glittery lip gloss; creamy blush spread onto the apples of my cheeks; the darkest mascara, applied in several coats to resemble the faux lashes I’d rather not pony up the cash to buy. And I top it all off with four sprays of makeup-setting spray.But as much as I love makeup, I have a dirty secret: I hate washing my face. Many mornings, I wake up to “raccoon eyes” caused by my failure to remove my waterproof mascara before bed. Washing my face at night has always seemed like too many steps—eye makeup remover on cotton balls, cleanser, wash, rinse, repeat. And even then, it felt like my skin was never truly clean. That all changed when I received a free sample of bareMinerals Oil Obsessed Total Cleansing Oil (;bareminerals.com, sephora.com, andnordstrom.com). I was skeptical at first. Could my makeup-covered face really be completely cleansed with oil? With my combination skin, why would I want to make my T-zone shinier than it already was? 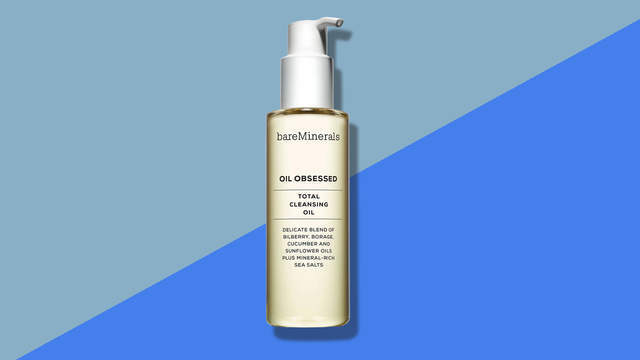 But a beauty editor friend had been touting the benefits of cleansing oilfor nearly a year, and I finally decided to try it. Within weeks, I swear my skin was smoother, breakout-free and—I apologize for being totally cliché—glowing. At $30, it’s pricier than some drugstore brands, but it’s honestly the most amazing product I’ve put on my face in a long time. To use, I spread the lightweight formula all over my face with my fingers. The bottle recommends using three to four pumps, but I find that two is usually plenty. Once my skin is completely covered, I wet my fingertips, which transforms the oil into a milky substance. Bonus: it smells amazing.